RICHARD PHILLIPS-JONES takes a trip to the local cinema, circa 1970, chock full of horror classics! 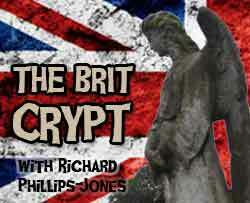 It’s like heaven for a fan of Brit-Horror films. Just imagine, your local cinema having a programme of entertainment lined up like this: Every week featuring at least one helping of Brit-Horror, with the days in between filled with other indigenous faves from Carry On’s and Morecambe & Wise to Britsploitation. This somewhat weather beaten poster gives an intriguing glimpse at a moment in time, in this case at the Plaza Cinema, Newent, Gloucestershire. However, it could be the list of coming attractions for any number of cinemas across the UK at the time, the kind of small local operations which were what you might call second-run houses. Whilst the big city centre cinemas of EMI’s ABC chain or Rank’s Odeon circuit would have all the latest releases, these smaller provincial houses would often have to wait a while for such films, filling out their schedules with re-releases, or dealing directly with independent distributors like Tigon or Scotia-Barber. As this particular bill demonstrates, this could make for an enjoyably eclectic selection. As you can see, there’s plenty of Hammer movies on offer, and judging from the most recent films on the list this particular poster dates from 1970. This was a time when cinema attendances in the UK would soon drop alarmingly, hitting an all time low as the decade progressed. This trend would contribute to the demise of Hammer and their contemporaries. What is striking is that a film’s theatrical life back then was much longer then than it is now. Before the advent of home video and with more venues to be screened at, a film could happily do the rounds for a good couple of years, more if it was popular enough to warrant a reissue a bit further down the line. Take, for instance Dracula Prince Of Darkness, already five years old at this point but still deemed capable enough of pulling an audience to make this month’s programme. British horror had already provided a healthy library of films to supply a steady stream of late-night features by this time, several double bills having become popular attractions by the late 60s. The decline in cinema attendances in the 70s would also impact both on the number of venues in the UK, and on the nature of those that survived. Larger urban cinemas began to split into two or even three screen venues in order to offer more films to smaller audiences, and maximise revenues. Tellingly, this poster indicates a movie theatre entering its last days, since it appears to not even open on Mondays and Wednesdays. Smaller independent houses such as these often found themselves forced to close altogether, many becoming bingo halls or, later on theme pubs. If you look into the history of your local area, you might be surprised at what buildings in the vicinity once held audiences thrilled by the likes of Countess Dracula or Frankenstein Must Be Destroyed. Incidentally, what information I’ve been able to find online suggests that the building which once housed the Newent Plaza is now home to a printing firm. It also suggests that the cinema closed its doors in 1961, which this poster appears to totally contradict. If anyone can shed some light on this, please drop us a line in the comments section. 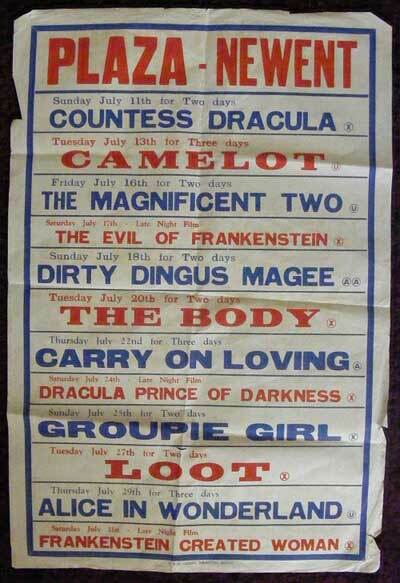 I remember the late night saturday movie double bills at the Muswell Hill Odeon in the early 1970s they were often horrors, the oldest film I saw was Hammer’s 1958 Dracula, but it was mostly 70s stuff like the Vampire Lovers, Dr Jekyll and Sister Hyde and the Dr Phibes films. Doctors in Horror Films – they're four kinds of crazy! RICHARD PHILLIPS-JONES has been away. He explains why, and reflects on the medical profession’s place in British horror. Just in time for Halloween, RICHARD PHILLIPS-JONES introduces "An Evening with Boris Karloff and His Friends"